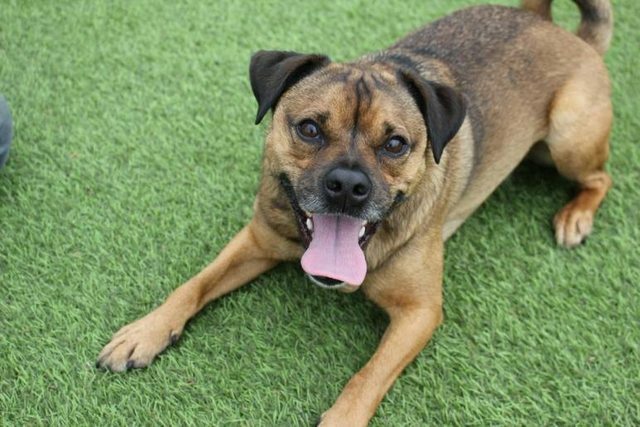 Buddy is a 3 year old male Pug cross Jack Russell Terrier. Buddy was originally found as a stray and came to us via a local pound in September 2017. He was rehomed in January 2018 but was sadly returned as he was starting to snap at people in the home. Prior to this Buddy had never shown any aggressive behaviour and often went home with a member of staff for breaks away from the kennel environment. He was always perfectly well behaved and we were very saddened to hear how his behaviour had changed. Since coming back to us Buddy has now moved into one of our office areas as he was quite anxious in the kennel environment. Buddy has a fantastic, playful character and makes for an entertaining office pal. He particularly loves enrichment activities such as ‘Snuffle Mats’ and ‘Kong Wobbler’ toys where he has to figure out a way to find his treats! He happily welcomes plenty of different visitors into the office and is happy to have a cuddle and make new friends. Buddy is also a big hit with our dog walkers and has several doggy friends that he often shares walks with. 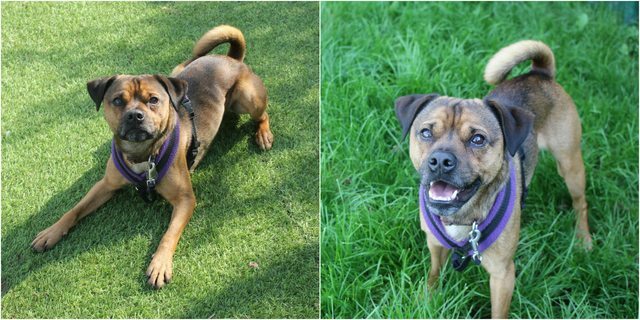 When introduced to dogs properly Buddy quite enjoys their company and we feel that he could live with a compatible dog in his new home. He does not like cats. It is vital that Buddy’s new owner is prepared to make several trips to and from the rescue in order to spend some quality time with him and build a bond before adoption. This will then progress into a slow introduction into his new home.